Wajahat Ali: Why is Trump still ignoring Saudi Arabia's brutal human rights abuses? Wajahat Ali Why is Trump still ignoring Saudi Arabia's brutal human rights abuses? The Saudi regime is subjecting female activists and other political prisoners to imprisonment, torture and sexual abuse. And America says nothing. At first glance, President Donald Trump and Mohammed bin Salman (known widely as MBS), Saudi Arabia’s crown prince and de-facto ruler, seem like an odd couple. If you examine their narcissistic rhetoric and corrupt behavior, however, it becomes clear they speak the same political language. 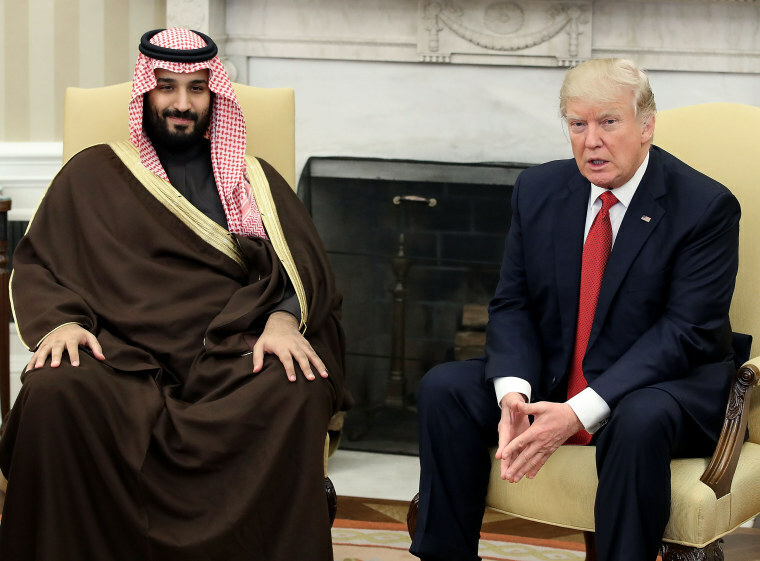 Here are two reckless and garish vulgarians, both born to wealth and both shielded by privilege and ensconced in power, who openly engage in a mutually beneficial relationship that emboldens the kingdom’s human rights abuses, including the imprisonment of women’s rights activists and the brutal murder of Washington Post columnist Jamal Khashoggi. Here are two reckless and garish vulgarians, both born to wealth and both shielded by privilege and ensconced in power. Like with Khashoggi’s murder, Saudi Arabia’s crackdown is not exactly a secret. Ten Saudi women were arrested last May, a month before MBS decided to lift the country’s notorious driving ban. These women included prominent activists Loujain al-Hathloul, Aziza al-Yousef and Eman al-Nafjan, all of whom were detained after peacefully protesting the country’s women’s rights abuses and ban on women driving. In late July, Samar Badawi was also arrested. She was recognized by the U.S. for her activism and given the U.S. International Women of Courage Award in 2012. She’s also the sister of Raif Badawi, a Saudi blogger currently sentenced to 10 years in prison and 1,000 lashes for allegedly insulting Islam. MBS was initially hailed as a modernist reformer by several prominent American pundits. Instead, he’s emerged as the Middle East’s incompetent and ruthless King Joffrey. Yet this “reformer” has kept activists in a secret prison for over a year, where they have been subjected to torture, including beatings and sexual abuse. In March, a Riyadh court formally charged several women with espionage and conspiracy. Amnesty International, the U.N Human Rights Council and all 28 European Union governments have criticized Saudi Arabia for this “arbitrary detention” and demanded the women’s release. Canada called on Saudi Arabia to release the activists. Saudi Arabia responded by cutting off diplomatic relations with Canada and kicking out its ambassador. Meanwhile, Trump has said nothing. Also in March, The New York Times reported that Saudi Arabia had detained and tortured a U.S. citizen and Harvard-trained physician named Dr. Walid Fitaihi since November 2017. He was one of the victims of the Saudi version of the infamous “Game of Thrones” red wedding scene, where MBS consolidated his power and wealth by detaining 200 prominent Saudis and seizing billions of dollars. Fitaihi remains one of the dozens still in prison. A former detainee, Aya Hijazi, is speaking up for Fitaihi. She’s a dual citizen who was released from prison in Cairo after President Trump’s intervention. “Not making Walid Fitaihi a priority will send a message that America isn’t really first. Financial deals and petroleum are,” she said in a text message to The New York Times. Trump ran on a nationalist “America First” platform. However, when it comes to Trump’s interactions with Saudi Arabia, the security of fellow Americans and the promotion of human rights aren’t “first” at all. Instead, it’s all about quid pro quo and the “art of the deal,” which does not include democratic values and freedoms. Trump has also smeared Khashoggi as a potential radical Islamist. (He wasn’t.) If you’re keeping score, Trump has sided with MBS, North Korea’s Kim Jong Un and Russian President Vladimir Putin over U.S. intelligence communities multiple times over the course of his first two years in office. It’s almost as if he’s fond of violent, authoritarian leaders. If you’re keeping score, Trump has sided with MBS, North Korea’s Kim Jong Un and Russian President Vladimir Putin over U.S. intelligence communities multiple times over the course of his first two years in office. Trump also exaggerates Saudi Arabian arm sales and investment as a reason to maintain diplomatic relations with the country. The Saudis have courted Trump’s good graces and loyalty by spending vast amounts of money in Trump properties since he became elected. They showered him with bling and an opulent reception when he visited the country for his first presidential foreign visit. Trump, who blamed Saudi Arabia for the 9/11 terror attacks, even appeared to "curtsy" upon receiving a golden medal from Saudi King Salman, even though he criticized President Obama for “bowing” when he met Saudi Arabia’s King Salman in 2009. Apparently flattery, financial deals and lucrative contracts can change hearts and minds, but they still can’t help the women and activists who are tortured, beaten and arrested for desiring dignity and human rights. With Trump mesmerized by dollar signs, a nation’s lonely eyes look to Jared Kushner, the president’s son-in-law and advisor, for moral clarity and ethical leadership in dealing with Saudi Arabia. In February, Kushner met with MBS. Although a Middle East peace plan was discussed, allegedly there was no discussion about detained activists, the torture of a U.S. citizen and the murder of a U.S. journalist. Kushner, like his father-in-law, has said nothing. What drives Kushner's friendship with MBS? Of course, when it comes to the Middle East, America’s selfish political and financial interests have always trumped our democratic values. Ever since President Franklin D. Roosevelt defeated other suitors and successfully wooed King Ibn Saud on the USS Quincy for access to Saudi oil, both Democratic and Republican presidents have turned a blind eye to the kingdom’s horrific and ongoing human rights abuses, including its oppression of women, religious minorities and political critics. Both Obama and Trump have been complicit in Saudi Arabia’s ongoing war crimes in Yemen, where deliberate bombings have killed innocent civilians in a country experiencing a humanitarian crisis, famine and cholera enduring four years of civil war. What’s different with Trump, however, is his apparent inability to even pretend to care about projecting democratic values. He can’t even bring himself to parrot the cliched diplomatic bon mots, which is surprising considering his career as an actor. Foreign relationships are treated like an episode of “The Apprentice,” where world leaders are expected to be sycophantic contestants who placate Trump’s ego and fill his coffers. At the end of March, Saudi Arabia announced it had provisionally released three of the women activists who are currently standing trial, including feminist leaders Aziza al-Yousef and Eman al-Nafjan. The same day, the Trump administration reportedly approved six secret authorizations by companies to sell nuclear power technology to Saudi Arabia. It’s a pay-for-play world and Saudi Arabia has chips to spare. Ultimately, we should not expect Trump to demand the release of detained human rights advocates. Instead, we have to call on advocacy groups, international agencies and celebrities to continue to put public pressure and scrutiny on Saudi Arabia. Journalists and columnists should use their platforms and columns to uplift the narratives and names of the brave activists who are still being tortured. Nations should follow Canada’s lead and openly condemn Saudi Arabia for its abuses. Private companies and individuals who engage in lucrative business deals with Saudi Arabia should consider boycotts or using their financial relationship as leverage to advocate for justice. Any action to help these innocent human rights activists will be a welcomed relief compared to the willful disregard of the Trump administration, which has traded their lives and righteous struggle for dollar bills and hotel reservations. Wajahat Ali is a New York Times contributing op-ed writer and an attorney.